The last time I was in Whole Foods was my first time in there since going Paleo. I might have went a little crazy. For reals. I bought pound after pound of grassfed beef (all types), veal, pork, chicken, and two types of fish. I bought a few fillets of sea bass and a rather large chunk of wild caught Sockeye salmon. We have long since gone through all of it, save the salmon. I had popped it in the freezer to keep so, a couple of days ago, I pulled it out and set it in the fridge to thaw. I felt pretty sure that I would bake it with herbs and lemon (from my tree) but there it was tonight, staring at me. I had already decided that dinner would be easy…store-bought rotisserie chicken, sauteed kale and bacon (thank you, nom nom Paleo!!) and roasted carrots with cumin and cinnamon, so I was not in the mood to deal with the salmon. Unfortunately, I didn’t have a choice. I couldn’t have it going bad. That’s crazy talk. Knowing I wasn’t having it for dinner, though, kinda threw a monkey wrench into my plan for herbs and lemon as I am not a big fan of leftover seafood. So, how could I prepare the salmon so that it would actually get eaten? 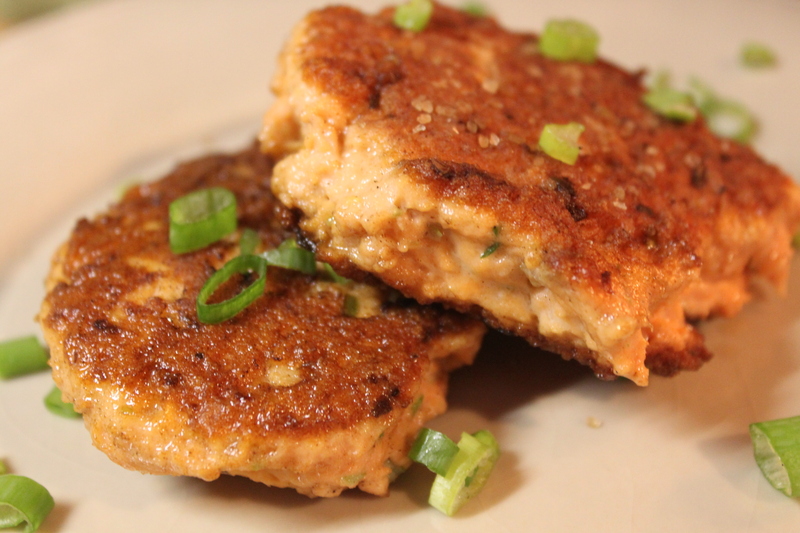 Mmm hmmm…salmon patties. Grew up on them. love them! and leftover salmon patties? Now, that’s a different story. Don’t ask me what the difference is because I don’t know. I just know that I will eat leftover salmon patties, but I won’t touch leftover baked salmon. I’m weird, and I am fully aware. Thanks. Put all ingredients into a food processor and give it a whirl until it all comes together. Shape into patties (this is messy) and set aside. Add 1 T coconut oil and a pat of pasture butter to a pan over medium heat. When the butter sizzles, place the patties in the pan and cook 3-4 minutes per side until browned, flipping once. I can already tell you that I will be crumbling these into my breakfast scramble tomorrow morning. They are pretty dense, but really tasty. This entry was posted in Seafood and tagged Paleo, salmon, salmon patties, sockeye. ← Whole 30 and a life 180! I am going to try this one! Thanks Primal Belly! Wow, I just pinned this recipe and it’s already been re-pinned five times!